After a year of development, I have recently made available urethane replacement bushings for the 964/993 front lower control arms. They are available for purchase through me for $103.00 per kit. One kit will outfit two front lower control arms. Grease developed for this particular urethane is included in this kit. Notice these bushings incorporate grease channels to help prevent the bushings from drying out. I have three sets of 993 ‘core’ control arms that I use as exchange parts with these bushings already installed. This service is available for those who do not wish to remove their original rubber bushings. Removing the original rubber bushings is not that difficult, just tedious and time consuming. Removing the control arms is a very easy job. It will take one about an hour to complete the swap. Paypal the same as my email. Last edited by chris walrod; 05-13-2010 at 04:04 PM. you know i'm in! pm coming your way!!! Looks great, Chris. You da man! Super! any plans to make the 322x32 al/ hats available? I have one set of 993 ‘core’ control arms that I use as exchange parts with these bushings already installed (more sets of cores to be available shortly). 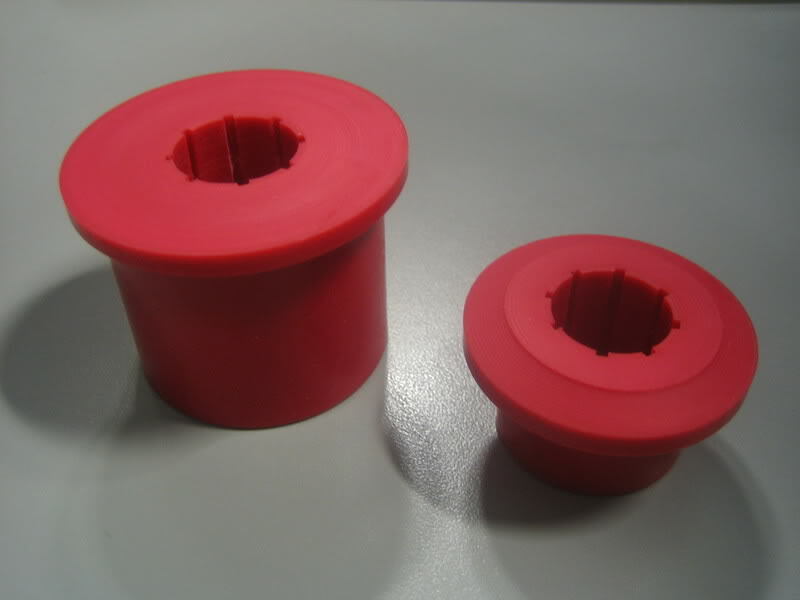 This service is available for those who do not wish to remove their original rubber bushings. VERY smart business. Not a chance I'd want to change the bushings, but I'd be willing to put down a core deposit, swap 'em, and send you my old ones when the time comes! I'm in. Hopefully the back end can be next. What is your business exactly? Those look awesome by the way. Been looking for bushing options other than the Smart Racing $1k ones. Chris, I am interested in a set. I will do a check on my lower arms this weekend. Any idea when you hope to have the DIY ready? My braking wobble is back after having the rotors replaced again. The last set lasted about 3,000 miles. So I'm now thinking the wobble is related to the control arms. Nice touch on the donation too. Good stuff all around. PS- What's the HP gain? Absolutely, just need to pile more miles on them before I release these hats. They are quite nice. Its a shame high-end aluminum is so freakin' expensive. Well, during the day I am a track support engineer for the Champ Car Atlantic series. I work for a company who designs and manufactures open wheel (primarily) race cars. Last edited by chris walrod; 05-28-2010 at 05:59 PM. Well, during the day I am a track support engineer for the Champ Car Atlantic series. I work for a company who designs and manufactures open wheel (primarily) race cars. I was a Champ Car (the 940hp iteration) gearbox specialist in a previous life. I am using these bushings as a small business venture to try to learn the mechanics of small business learning elements such as state/fed taxes, website building, general business operations etc. Something I have wanted to do for some time now. Chris is too modest, but I'm happy to advertise his resume. He works for a "small", "no-name" race car builder called, um, Swift Engineering!!. It's like having a guy from McLaren or Lola or Cosworth on the board. Chris, congrats on the venture and a huge kudos to you for doing the right thing and becoming a sponsor right out of the gates. I wish you the best of luck; you are one of the nicest and most helpful individual here. Yes!!! Chris...you have a PM.